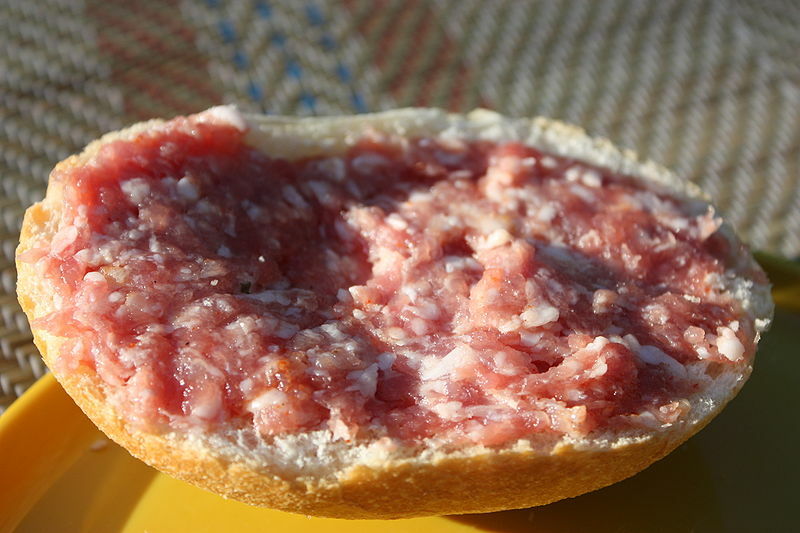 Mett is a preparation of minced pork that is popular in Germany. The name is derived from Low German mett for "chopped pork meat without bacon", or Old Saxon meti for "food". It also known as Hackepeter (20th century jargon, Northern Germany and Berlin). It consists of minced pork meat, normally sold or served seasoned with salt and black pepper, regionally also with garlic or caraway, and eaten raw. Left: Mett served as a Mettigel (Mett hedgehog). It is also permitted to add chopped onion, in which case it is known as Zwiebelmett (onion Mett). Legally, German Mett is not allowed to contain more than 35% fat. Schinkenmett ("ham Mett"), prepared from the upper thigh (ham), is considered especially fine. In contrast to the normally available locally minced Mett, coarse pork Mett (Grobes Schweinemett) is produced in an industrial meat grinder. To preserve its structure, the pork meat is normally processed in a semi-frozen state. The "minced meat directive" does not permit temperatures over 2°C; ice may not be used for cooling. Raw Mett is normally eaten on bread rolls (Mettbrötchen) or sliced bread, frequently with a garnish of raw onion rings or diced raw onion. At buffets, Mett is occasionally served as a Mettigel ("Mett hedgehog", also Hackepeterigel or Hackepeterschwein). This form of serving Mett was especially popular in the 1970s. 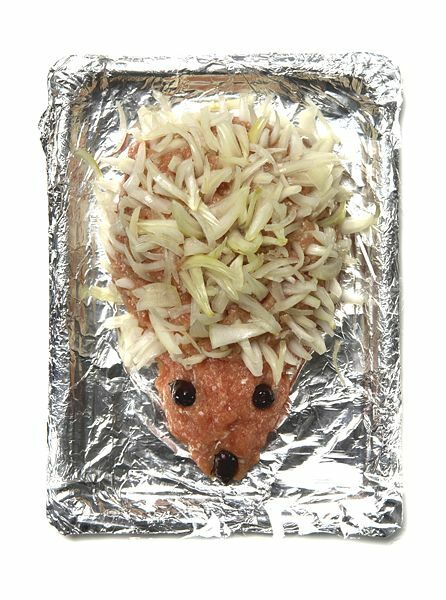 To produce it, a large amount of Mett is shaped as a hedgehog, quartered onion rings or pretzel sticks are used as spikes, olives as eyes. Mett can be made more durable in the form of Mettwurst, a spicy and frequently smoked raw sausage.